BOSTON — Jaylen Brown’s heart nervously skipped a beat while vacationing in Spain when he received an unexpected offseason call from Boston general manager Danny Ainge in the wee hours of a late June morning. The talented young Celtics swingman knew it wasn’t a call from his boss offering tips on where to get great paella and tapas. The FC Barcelona soccer fan briefly wondered whether he would be told that he had been traded, since the call came on the eve of the 2017 NBA draft. Instead, Ainge wanted to pick Brown’s brain on a draft prospect Brown knew very well in Jayson Tatum. “The day before Danny made the pick, he called me and he asked me what I thought. And I said, ‘Jayson is that guy,’ ” Brown said after the Celtics defeated the Cleveland Cavaliers, 102-88, on Wednesday night. “I think [Ainge] will attest to that. I told him, ‘The way [Tatum] shoots the ball, his scoring mentality and his length, it would be tough for teams to deal with us.’ He agreed. I don’t think that was the deciding factor. Brown and Tatum had familiarity with each other from playing together in elite prep summer camps before going to college. Boston selected Brown, a swingman out of the University of California, Berkeley, with the third overall pick in the 2016 NBA draft. The Celtics selected Tatum, a small forward from Duke, with the third overall pick in the 2017 NBA draft. And winning they have done. The Celtics improved the Eastern Conference’s best record to 31-10 after Wednesday’s victory against LeBron James and the visiting Cavaliers. Former Celtics guard Isaiah Thomas returned to TD Garden but did not play the second of back-to-back games for the Cavaliers. Jaylen Brown (left) of the Boston Celtics takes a shot against LeBron James (right) of the Cleveland Cavaliers during the first quarter at TD Garden on Jan. 3 in Boston. Brown and Tatum combined for 29 points, 13 rebounds, 6 assists, 2 steals and played tough defense in the Celtics’ victory. Through half of the season, Brown and Tatum are rivaled only by the Philadelphia 76ers’ Joel Embiid and Ben Simmons as the best sophomore-freshman tandem in the league. “We pushed each other from the jump. I got high expectations for myself. I am actually disappointed that I left a lot of points on the board [Wednesday night],” the 21-year-old Brown said. Brown put his arm around Tatum like a big brother from day one at the practice facility in nearby Waltham, Massachusetts. They worked out together after summer league practices and before summer league games. Brown was asked to play summer league only at the Rocky Mountain Revue in Salt Lake City, but he opted for more seasoning in the Las Vegas Summer League. Brown and Tatum dominated the entire summer. The new-look Celtics appeared imposing in the preseason with Kyrie Irving and Brown at the guard spots, Gordon Hayward and Tatum at the forward spots and Al Horford at center. That lineup didn’t even last one regular-season game, however, as Hayward suffered a gruesome broken left ankle early in a season-opening loss at Cleveland. The former Utah Jazz star averaged a career-high 21.9 points last season. With Hayward out indefinitely, Irving couldn’t carry the Celtics by himself. Brown and Tatum stepped in to relieve the pressure with strong play on both ends of the court. Celtics fans are certainly wondering whether Hayward will come back late this season and had to be encouraged when he recently said he was open-minded to the possibility. He left TD Garden on Wednesday night walking well with a brace on his surgically repaired ankle. But with or without Hayward, the NBA’s top-rated defensive team still has the talent to win the Eastern Conference title if Brown and Tatum continue to complement Irving. Brown is second on the Celtics in scoring behind Irving, averaging 14.4 points, 5.8 rebounds and 1.2 steals. Brown has started in all 36 games in which he has played. His 519 points has surpassed his total of 515 through 78 games last season. Jayson Tatum of the Boston Celtics shoots the ball against the Cleveland Cavaliers on Jan. 3 at the TD Garden in Boston. Tatum, 19, is third on the Celtics in scoring, averaging 14.1 points and 5.5 rebounds while shooting a team-best 46.8 percent from 3-point range. 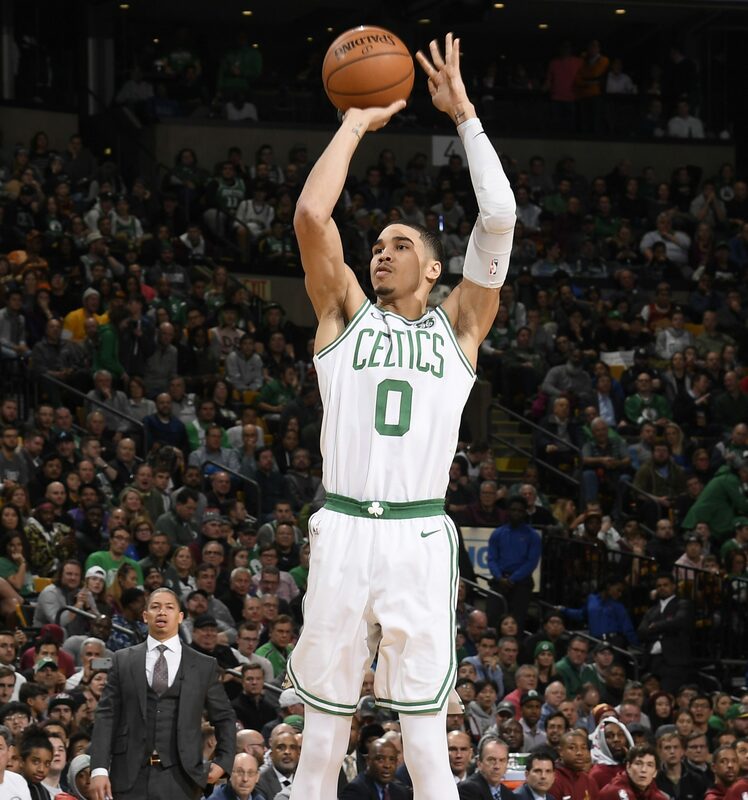 The teenager of few words has 579 points through Boston’s 41 games this season, which is the fifth-most for a Celtics rookie behind Larry Bird, Dave Cowens, Paul Pierce and Antoine Walker. He is the NBA’s Eastern Conference Rookie of the Month for December. “It just shows the cohesiveness of our team, how we came together from obviously losing one of our best players on the first night and still be able to accomplish what we have. Hopefully, we can keep it going,” Tatum said. In a joyous Celtics locker room after a win over their East rival, Irving, Brown and Tatum shared a warm laugh before talking to the media and departing to brave the cold winter night. After a painful start to the season, Irving, Brown and Tatum have eased the pain for the Celtics.